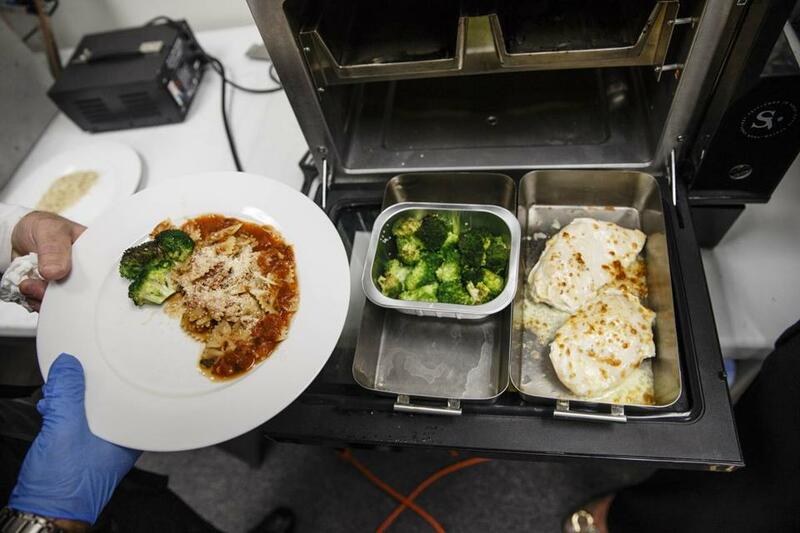 Suvie’s device has four zones: one each for heating sauces, cooking meat, steaming vegetables, and cooking rice or pasta. A Cambridge startup called Suvie is preparing to wage the Battle For Your Kitchen Counter. Victory means a permanent spot on the countertop, alongside the microwave, toaster, and coffeemaker. Defeat means a trip to the neighborhood Goodwill store — or at least the basement — like the bread machine, the George Foreman grill, the electric wok, and other appliances that enjoyed one brief shining moment atop the granite. And it’s a clash that is dominated by big players like Whirlpool, Samsung, and Haier, a Chinese conglomerate that owns the GE brand of appliances. But Suvie is doing something ambitious and interesting: adapting a cooking technique called sous vide, which relies on low temperatures to lock in flavors, for everyday use. The company’s appliance, which will debut on the funding site Kickstarter next month, also makes sous vide super-simple, in a “set it and forget it” way. (That phrase was popularized in infomercials for Ronco Showtime Rotisserie oven, still on the market but arguably a loser in the Battle of Your Kitchen Counter). “If I count the number of people coming in asking if we carry sous vide equipment, it has been on the increase in the last few years,” says Jennifer Hill, the owner of KitchenWares in Back Bay. “It’s a trend that’s not going away.” The store, however, doesn’t yet sell sous vide gear. Here’s a quick primer: sous vide, pronounced “sue veed,” is French for “under vacuum.” Food is sealed in a vacuum-packed plastic bag, and then immersed in a water bath that is heated to a precise temperature. Cooking times are typically an hour or more, since the temperatures are low — usually around 135 degrees Fahrenheit. But with such low heat, the technique doesn’t allow food to get overcooked, or flavors to escape as they do in a conventional oven. Suvie, in its three years of existence, has been incredibly low key. The sign outside the company’s office is blank, and no one involved lists the business on their LinkedIn profiles. The co-founders, Robin Liss and Kevin Incorvia, previously worked together at Reviewed.com, a Cambridge-based product review site that was acquired by USA Today in 2011. I stopped by Suvie’s office on a recent Friday to see the machine and eat lunch. The company has built about 14 different prototype machines, Liss told me, and last summer tested some of them in consumers’ homes. The premise is that you would receive packages of vacuum-sealed meats, vegetables, and starches delivered in a cooler to your home. In the morning, before leaving for work, you’d tap each package on the front of the Suvie so that it would recognize what you’re cooking. Then you’d load each item into the Suvie’s four separate zones: one for heating sauces, one for cooking meat, one for steaming vegetables, and one for cooking rice or pasta. Finally, you would set a timer to indicate when you want to eat. Inside is a specially-designed compressor that can chill water so that everything inside the machine is kept at about 35 degrees — until the right moment, when it begins to heat the water to start the cooking process. When you get home, there’s one last step: opening up the packages, and putting the meat back into the machine for a few minutes to cook it under a broiler element. Otherwise, sous vide leaves proteins tender, pale, and soft. Broiling makes the surface crispy and brown. As we sit down at a folding card table to eat, Liss says, “We spend a massive amount of time in the kitchen — women spend most of it, really — and there has been relatively little innovation there.” Meals purchased from Suvie will cost about $10 to $12 a serving, she says, but her vision is that consumers with their own vacuum sealer will be able to use the device to cook ingredients that they purchase, or that local food producers will eventually put their meats, veggies, and sauces into Suvie-compatible packages. Suvie has so far designed about 30 meals for the machine that are built around chicken, salmon, cod, shrimp, and meatballs. “The fastest meal to make is fish,” says Kevin Doherty, a former Omni Parker House chef who now works for Suvie. “Probably cod, cous cous, and green beans, which you can do in less than an hour.” It can cook four adult servings at once. Liss was reluctant to talk about the price of the machine yet, except to say that it will sell for “under $1,000.” It is a bit taller than a standard microwave. To develop the machine, the company raised about $3.7 million from individual investors. Suvie has just eight full-time employees. I sampled a first meal of chicken, bowtie pasta with spicy Arrabiata sauce, and broccoli. Then a second of lemon dill cod, brown rice, and green beans. Both the chicken and cod were juicy and full of flavor, the vegetables crunchy, and everything was cooked more carefully than you’d typically find at a neighborhood restaurant. The true test will come when the company offers its device for pre-orders on Kickstarter next month. Another local company fighting the Battle for Your Kitchen Counter is SharkNinja, the privately-held maker of Ninja-branded coffeemakers, blenders, and cooking devices. Evan White, a product manager at SharkNinja, says that “speed and convenience are the top two priorities” for consumers right now, when it comes to purchasing something new for the kitchen. “Also cleanability, which is underrated,” he adds. All those forces are what slowly turned microwave ovens from a novelty into a must-have, after Massachusetts-based Raytheon first introduced a commercial version in 1947; the first successful consumer model — the Radarange — didn’t arrive until 1967, and today more than 96 percent of US homes own a microwave, according to the Census Bureau. Technologies don’t often see that kind of widespread adoption, but Liss tosses out terms like “revolutionary” and “life-changing” when she talks about Suvie. She’s hoping it will win a precious spot on a few million countertops, eventually.